Aero Mist offers a wide variety of cooling solutions to solve the problem of keeping animals cool during the hot summer months. The dangers of heat may put livestock at risk of heat stroke and cause lower productivity putting your investment at risk. Use easy to install pre-fabricated stainless steel misting kits or misting fans in locations where high temperatures can cause health problems to animals. Aero Mist animal misting systems also aid in the reduction of dust. Our mist system is the viable alternative to other forms of expensive air conditioning. Heat stress also poses a significant threat to your pets. Extremely high temperatures do not allow pets to shed body heat. 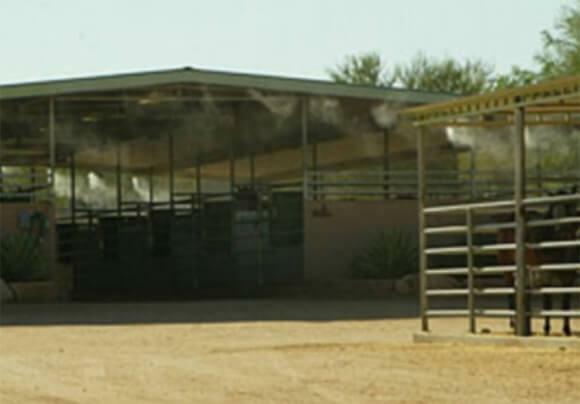 Aero Mist solves the heat stress problem by lowering temperatures in yards, kennels and pens. Misting systems are great at repelling flying insects, dust and airborne particles. Create the optimal environment and keep animals safe with our installed misting systems or Portable Misting Tower. Aero Mist provides animal cooling solutions for dairies, kennels, horse stables, zoos, aviaries, and livestock and poultry facilities.